Travel back in time and remember the wonders of the ancient world! 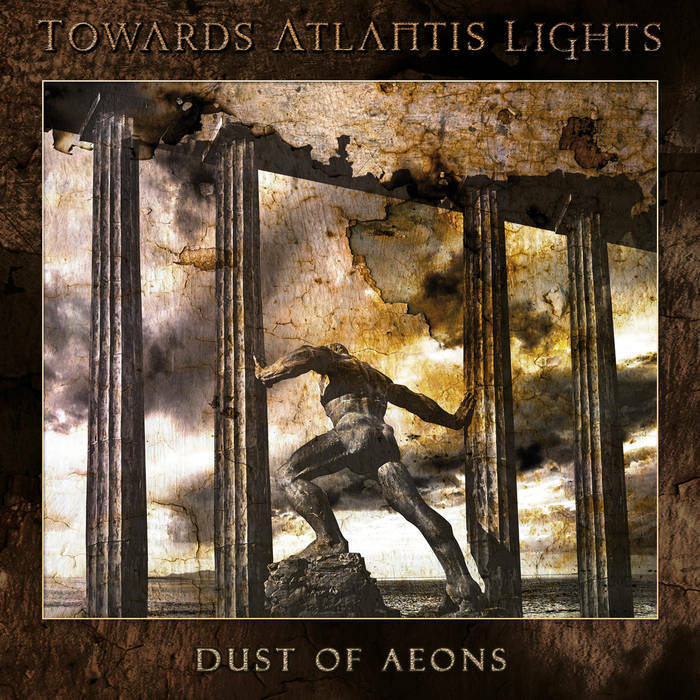 Toward Atlantis Lights is a multinational group that features members of Void Of Silence, Aphonic Threnody, Phanteist, Landskap, and more. The band started as a one-man project by Ivan Zara (guitars) in 2017 and then became a band by adding the talents of Kostas Panagiotou (keyboards & vocals), Riccardo Veronese (bass) and Ivano Olivieri (drums). They released their debut album “Dust of Aeons” a couple of months ago thru Indian label Transcending Obscurity Records, showing a well-executed mix of Doom Metal, Funeral Doom and Doom/Death that honors the musical background of the band members. The album starts with “The Bunker Of Life”, a 30 minutes song that it’s melancholic, intimate, oppressive and atmospheric. The song takes its time to develop, the band is in no hurry to deliver its message, so thru slow riffs and a heavy pulse they are able to induce in the listener a hypnotic state of mind. Add the fluctuation between clean vocals and death growls and you have an anthem that uses the tale of the fall of the Atlantis Island as a metaphor of the never-ending human quest for knowledge. Then it’s time for “Babylon’s Hanging Gardens”, a song constructed around atmospheric keyboards arrangements, deep and low vocals related to the rise and fall of Babylonian civilization. Overall, you can see it’s strongly anchored in the early 90’s Death/Doom sound. “Alexandria’s Library” is the other lengthy track of the album, clocking 16:35 minutes. A song with an intimate vibe that also focuses on one of the wonders of the ancient world. The lyrics reflects on the glory days of the library and the city, when it was one of the most important centers of knowledge of its time, and its progressive deterioration over the years. The album concludes with “Greeting Mausolus’ Tomb”, a song that, from the narrator’s point of view, serves as a heartfelt tribute to Mausolus, who ruled Caria between 377-353 BC when the city was part of the Persian Empire. This tomb is also considered as one of the wonders of the ancient world. After this historical and emotive journey, you can be sure you have listened to one of the most important releases of 2018. The band has a bright future and I can only wait for them to continue delighting us with future releases. For its epicness, I love bands that creates well-constructed songs, those where the players have the space and ability to maintain the listener’s attention no matter how long they are. It’s an excellent tribute to the early days of the “Peaceville Three” bands, a.k.a. My Dying Bride, Paradise Lost and Anathema. Relaxing and reading the lyrics to enjoy some great stories set in ancient times. In concert, it should be a transcendental experience. Transcending Obscurity Records released an astonishing box set for this album, I can only recommend you that you grab it while it last. Vin De Mia Trix, The Slow Death, Doom:VS, Majestic Downfall, (early) My Dying Bride, (early) Paradise Lost.